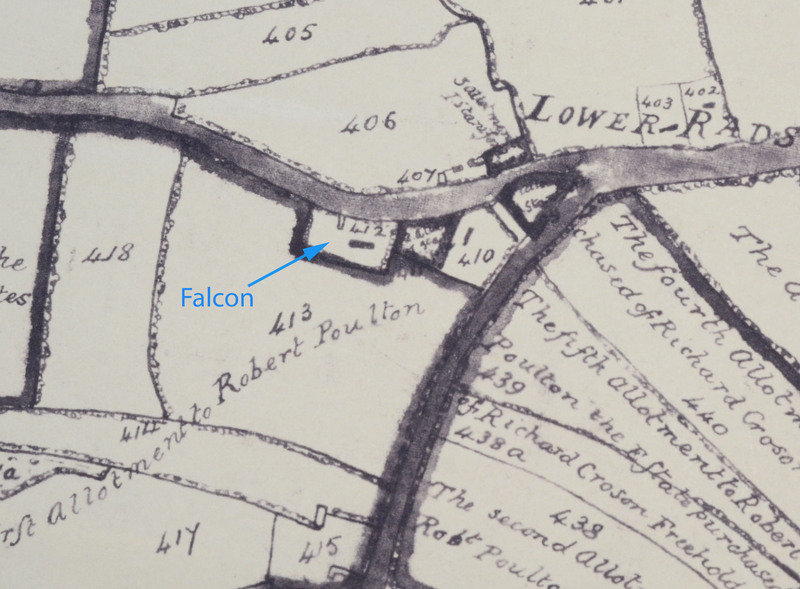 The Falcon sold beer at least as far back as 1765. 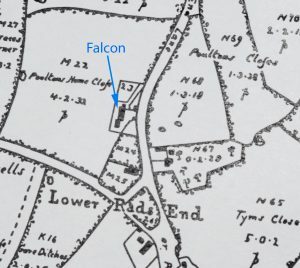 The 1765 Map and field book lists it as “Falcon ale House, yard, garden, lower Rads End”, owned and run by Edward Poulton in plot M23. 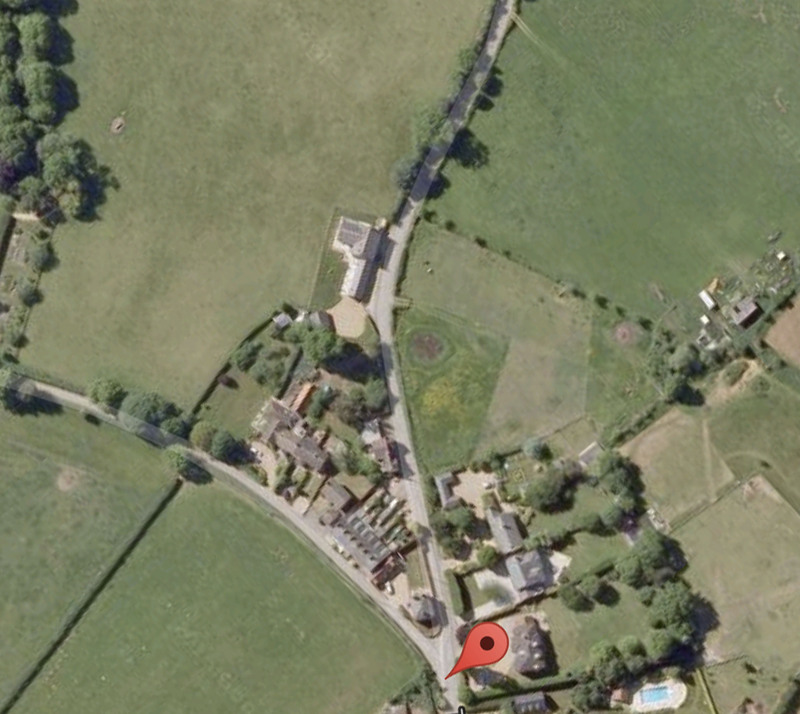 The map shows that the property has been rebuilt since then, but it was still on the same plot. For comparison, here is the 2016 satellite view from Google Maps, scaled and rotated to match the above map. The Falcon moved to the top right corner of the M23 plot. 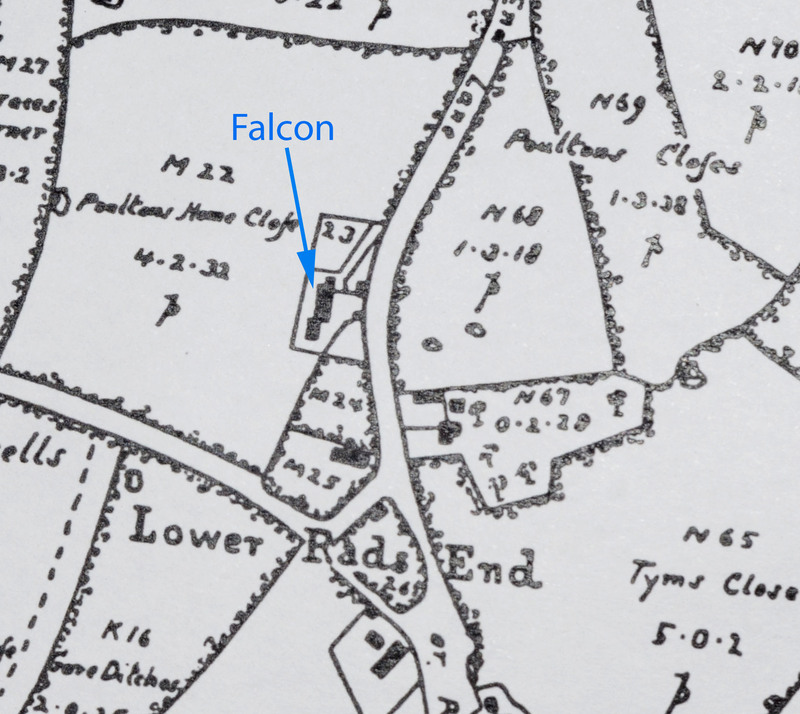 The 1806 enclosure map labels the same plot “Falcon public house, yard etc”, plot 412 (on page 103 using the page numbers at the bottom). Here are some changes of license recorded in the papers. 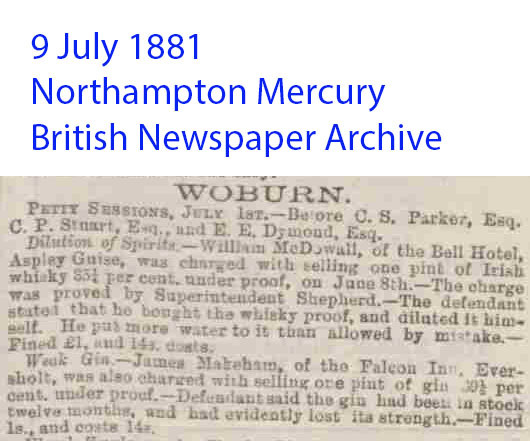 William Chambers, murderer, was arrested in the bar of the Falcon in 1902. The landlord then was Joseph Brinklow, and Paul Collins wrote in 2016 that he was Joseph’s grandson. Please contact Paul at drivekiwi@gmail.com if you have any information about Joseph, he asks. EVERSHOLT. A ROWDY LODGER. 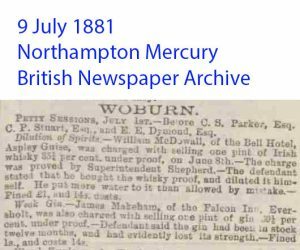 An Eversholt labourer, named Thomas Seagrave, did not appear at Woburn Sessions on Friday answer to a summons for being drunk at the Falcon Inn August 15th. P.c. Rachet proved the case, and said that hearing shouting at the Inn, went there and found defendant drunk. The landlord denied having served him. Mrs. Chew, a widow, of Rad’s End, said defendant had lodged with her three years. Came into the house shouting, pushed the furniture about and followed her with a hammer. She sent for the police. She had told … leave her house scores of times as his … was not fit for child or anyone else to hear. The Chairman: Why don’t … you clear him out? Witness: I have told him times without number to go, but he won’t. The house is not in his. name, and he has told people that … Inspector Harlow: When you saw Seagrave at the door of the Falcon what condition was he in? Witness: he was drunk. Defendant was fined 10s. and 8s. 6d. costs, with alternative of 14 days’ hard labour. Here’s a more serious event. 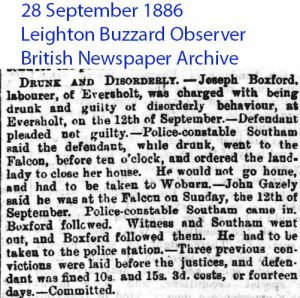 Whitbread, labourer, of Eversholt, was charged with assaulting Mrs. Ann Makeham, at Eversholt, on the 1st inst.— Defendant pleaded not guilty. —Mrs. stated that on the night the 1st inst. 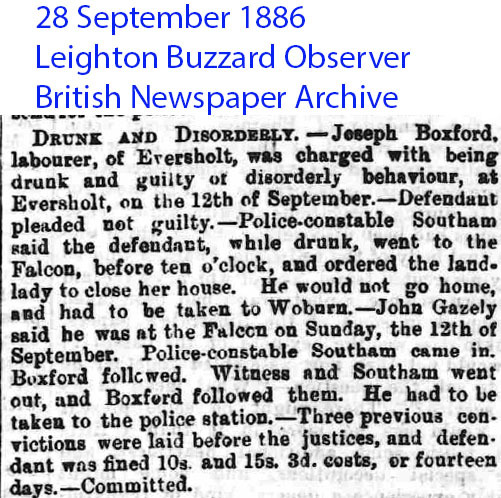 ‘defendant was outside her house (the Falcon Inn), talking to a man named Dix, who came into her house to get away from defendant. Whitbread followed, but witness refused to allow him enter the house. Defendant then struck witness several times on the arms, inflicting severe bruises.— George Everitt corroborated, and also stated that defendant struck him.—The Chairman said it was brutal to strike a woman, and defendant would have to pay fine of 10s. and 13s. … costs ; in default, one calendar month’s imprisonment, with hard labour. The last reference in the papers I can find to the Falcon operating as a pub was in the 31 January 1939 edition of the Leighton Buzzard Observer and Linslade Gazette. Eversholt ex-servicemen held a new year’s eve party there. However, the pub remained open until (I think) 1959. More Falcon news snippets. Transcript to follow.